This unit contains a lot of information, and it is okay if you don’t understand it all right now. The best way to understand coding concepts is by working through the coding challenges to see them in action! You can always refer back to this unit anytime you get stuck building your final app. At some point in your life, you’ve probably heard the word data. Data can mean a lot of things, but in computer science, data is the information that your app needs in order to work. To better understand this, let’s think about some apps and some of the information that they need in order to work. In your slideshow app, you (the programmer) entered in your favorite images. 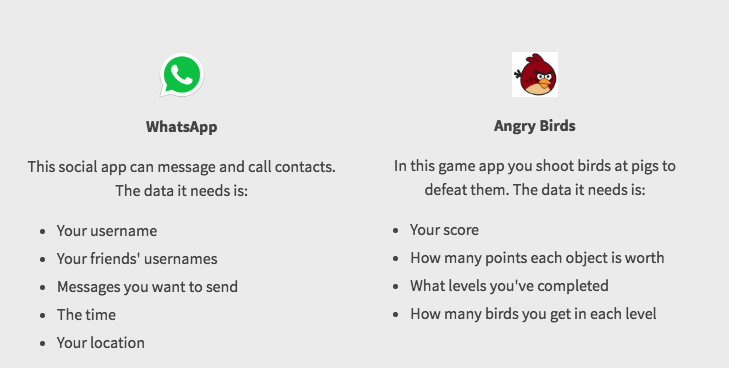 In Angry Birds, the programmer entered in how many birds the player gets on each level. In WhatsApp, the user needs to tell the app what she wants to send and who she wants to send it to. WhatsApp connects to your phone to get the time so it knows what time you sent a message. If you were using an app that helps you find the nearest grocery store, what data do you think the app needs to have? As you saw in the section above, data can be a lot of things! To make it easier for computers to understand what to do with the data they are given, data is put into categories. This is known as a data type. Programming languages revolve around three major data types: numbers, strings, and booleans. App Inventor also lets you use more complex data types such as colors and images. You don’t need to do anything with data types you'll learn about in this section but it will be good to keep them in mind as you code more. A number data type is just what you think it is! In App Inventor, you can use numbers by clicking on going to Math in blocks. You will use Math blocks whenever you need to use numbers. Here are some examples of when you might use a number data type in your app. A string data type is text. In App Inventor, you can create a string by going to Text in Blocks. Here are some the text blocks you can use. You should use a string anytime you want to add a text field to your code. Here are some examples of when you might use a string data type in your app. For now, there is not much to do with booleans other than keep them in mind. Booleans and logic will be covered in more detail in Code 3: Logic, Loops and Conditionals. To better understand variables and how to use them in App Inventor, let’s walk through an example. Imagine you are creating a game where the user can earn and lose points. You want to have a score for the player to see in a text box. At the start of the game, the player has zero points so you added a block like this to the game. The player sees zero in the textbox that contains her score. However, the player’s score will change as she plays the game. Each time she gains or loses points you have to update the text box. When she gets more points, you add a block like this. That works, but now what about the next time the player earns 10 points? You’ll have to update the text again to say 20. Then what if the player loses points? You will have to change her score to 15. What if she gains points again? This can get confusing really fast. In scenarios like this, you can create a variable to keep track of the player’s score. You can create a variable called score that always has the value of the player’s current score. As she plays the game, you can add and subtract points from score and you won’t need to worry about keeping track of what the her current score actually is. Here’s how it would work in App Inventor. First you would grab this block from the variables section. This block tells the app that there will be a variable and asks you to give the variable a name and a value. Here’s what the block would look like for a game where the player's score started at zero. With this block, you are telling the app that there will be a piece of data called score and that it will change value as the game is played. Every time the app starts up, it is going to create a variable called score and set it zero. Now you can do what’s called “set” and “get” your score variable. “Get” will allow you to see what the value of the score is. Here’s how you would tell your app to display the score in a textbox. “Set” allows you assign a new value for your user’s score. Every time the player earns points you can tell the app to do this. This tells your app to change the value of the score to whatever it is now and add ten to it. If the current score is zero, the new score would be 10. If the current score is 25, the new score would be 35. Now you don’t have to worry about reassigning the score every time your player gains or loses points. The app will just take the current score and add 10 to it. It is okay if you are still confused about variables! They are really hard to understand and the best way to understand them is by using them. You will use them in the coding challenge at the end of this unit and again over the next few coding units. Pick one of your favorite apps and identify at least three spots where you think the app creators used variables. You may have noticed in the section above that the variable block said “global”. There are two types of variables, local variables and global variables. When you create variables, you’ll have to think about whether you want to use the variable at multiple places in your code, such as the score variable from above, or if you want to use it in just one place. Global variables can be used anywhere. Like you saw above, the score variable needed to be used multiple times. You had to use it when the player earned points, when the player lost points, and to display it in the textbox. It could also be used for a high-score table. You can never reuse a name when using a global variable. If you did, your app won’t know which variable to use. Luckily App Inventor won’t allow you to create two variables with the same name. If you’re in doubt of which variable type to use, use global. Local variables can only be used at one spot in your code. If you need a variable to keep track of something in just one place, use a local variable. The local variable will only be able to be used inside the “local variable” block and App Inventor won’t let you use it outside of it. Unlike global variables, you can reuse the names of local variables. In the coding challenge, you’ll see examples of when to use global variables and when to use local variables. To learn more about global and local variables visit MIT’s website: Global and Local Variables. You should use lists anytime you have multiple pieces of information that you want to include under the same variable name. For example, if you wanted to display the top ten high scores for a game, you could make ten variables with names like HighScore1, HighScore2, HighScore3 and so on until you get to HighScore10. The easier way to do this would be to make a list called HighScores that contains the ten high scores and then display them by using their indexes. Using a list would also allow you to replace and add more high scores more easily and would save you a lot of time! Check out MIT’s website for more information on lists. Note: In many programming languages, lists are called arrays. and indexes start at 0, not at 1. Make sure to check the rules when learning a new programming language! In App Inventor, the component TinyDB allows you to save data on your user’s phone that will be there each time she logs into your app. It is important to know that TinyDB only allows you to store data locally. This means that two users cannot share data with the same TinyDB. When a user stores data into TinyDB, it will only be available on her phone, and no one else's. You will learn how to share information between phones in Code 4: Using Mobile Features & Connecting to the Web. The first block shows how to store values in TinyDB. In this case we stored our fruits list from earlier with the tag “Food”. The second block shows how to retrieve the fruits list from the database. The tag needs to be typed exactly as it was when the data was stored, including all capital letters. When you use this block you just get a blank string: “ ”. This is because the tag “myage” does not exist in your database! However, the tag “MyAge” does exists. Since your database did not recognize the tag, it defaulted to show you the block next to "valueIfTagNotThere", which is a blank string. You can make this string say anything you want. You can even make it be an error message to your user. If you create an app with multiple screens (like your slideshow app), components and variables will not be able to talk to each other between each screen. You will need to use a TinyDB in order to transfer information from one screen of your app to another. Visit this page for more information: MIT Screens. Congratulations on completing all of the content in this unit! It was a lot of information, so it’s okay if you don’t understand everything right now. You can always refer back to this unit when you are building your app. The Code Challenge is meant to incorporate everything you’ve learned so far, so give it a try! Description: Make a to-do list that allows users to enter in and remove items. Your app should remember the items each time your user opens the app. You may want to learn how to use a ListView before trying the challenge! Try your hardest to do this challenge on your own before you read the instructions. Remember, these instructions are just one way the challenge can be solved! You can also download our example app in the Google Play Store. Happy coding! Q1: How does the information you learned in this lesson change the way you see apps you use every day? Q2: What are some things from this lesson that you think will be useful in creating your app? Here are some additional resources on databases. You can use these now or if you need help when building your app!